From one of Vanity Fair's rising stars comes a brilliant, star-studded portrait of the glamorous and brazen Hollywood artist, muse, and writer Eve Babitz. Hollywood, California in the 60s and 70s was the cultural capital of America and the world-a movie factory, a music factory, a dream factory. 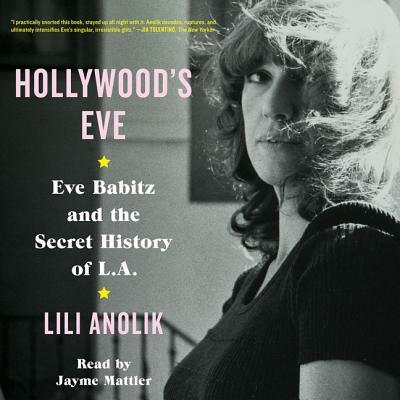 Eve Babitz, the subject of Lili Anolik's remarkable new book, is Hollywood's native daughter. Babitz, the child of bohemian parents and a graduate of Hollywood High, posed, at age twenty, in 1963, with the great French artist Marcel Duchamp. She was naked; he was not. The photo, cheesecake with a Dadaist twist, went on to become one of the most celebrated images of its era. Over the next several years, Babitz turned herself into the West Coast's answer to Edie Sedgwick: a groupie with an artistic streak (or is that an artist with a groupie streak?). She designed album covers for Buffalo Springfield and Linda Ronstadt, to name but a few, and seduced Jim Morrison, Steve Martin, and Harrison Ford, to name but a very few. Though Babitz was famous on the Sunset Strip by her late twenties, she was unknown as a writer. And then, Joan Didion read a short piece Babitz wrote on her alma mater, Hollywood High. Didion passed the piece on to Rolling Stone magazine. Babitz had been discovered. Over the course of her career, Babitz would publish seven books, usually billed as novels or short story collections, but always autobiographies and confessionals. To quote Dwight Garner of The New York Times, Reading Eve Babitz is like being out on the warm open road at sundown ... going sixty miles per hour with all four windows down. You can feel the wind in your hair. Life was fun and men and trouble for Babitz until a freak fire in the late 90s turned her into a recluse. Anolik's dazzling Hollywood's Eve is many things: a philosophical investigation, a critical appreciation, a sociological study, a cultural commentary, and a noir-style mystery. What it is above all else, though, is a love story. The lover, Lili Anolik, the love object, Eve Babitz, muse, artist, writer, and one-woman zeitgeist.